No. Well, kind of. Yes, their products are vegan-friendly and cruelty-free. The no is if you are someone that cares about companies as a whole, then no, they're not. 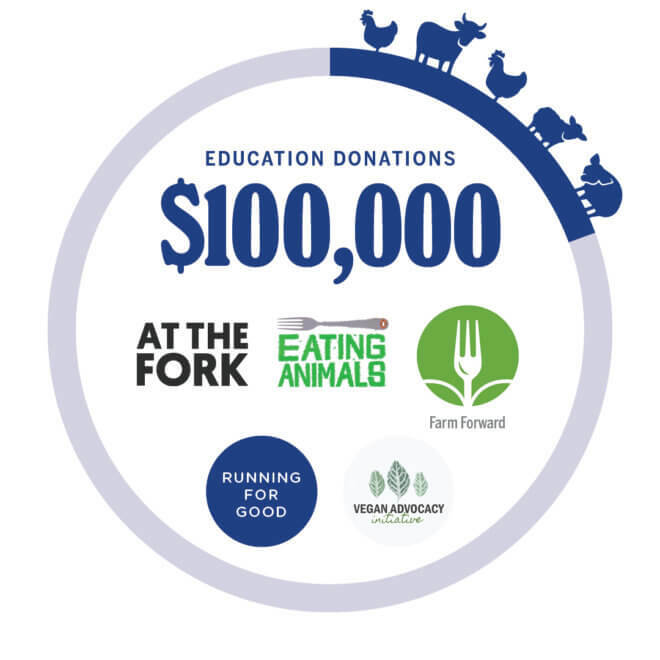 This year the company is proud to continue to support Farm Forward, an organization that supports advocacy around the New York Times best-selling book Eating Animals, which has been adapted into a documentary produced by Academy Award winning actress Natalie Portman and directed by Christopher Quinn, the award-winning director of God Grew Tired of Us. The film premiered at the Telluride film festival this past September. Farm Forward collaborated extensively with board member and author, Jonathan Safran Foer, for three years while he wrote Eating Animals and is planning to organize advocacy around the film. Just like Foer’s book, the documentary uses a combination of humor, adventure, muckraking, and memoir to explore the realities of contemporary animal agriculture alongside the complexities of food ethics. “We’re incredibly grateful for Dr. Bronner’s generosity and commitment to an ethical, just, and sustainable food system,” said Aaron Gross, Founder and CEO of Farm Forward. “Eating Animals has galvanized resistance to factory farming like no other work. With the support of Dr. Bronner’s, Farm Forward and other animal advocates are able to leverage the book and ultimately the film in tremendous ways,” continued Gross. Yay! Supporting a book that promotes veganism! Awesome. Hey! You know what else Farm Forward promotes? "Humane" animal agriculture. Here's the mission statement from their site. Promoting agriculture that combines the best in traditional husbandry and animal welfare science by increasing the market share of more humane, sustainable family farms. Eliminating the worst practices in factory farming. Advocating an acute reduction in the consumption of factory-farmed meat, fish, eggs, and dairy by encouraging conscientious consumer and institutional decision making. Supporting interdisciplinary research and undergraduate teaching about the cultural significance of animals and animal agriculture. Stimulating the production of essays, books, films, and religious activities that raise awareness about the problems in animal agriculture and the deeper cultural issues behind them. Let me say this. I shop at stores that sell non-vegan products. I bought a car that isn't vegan-friendly. I have bought products from companies that sell vegan and non-vegan merchandise. But here's the thing. None of those companies are out there promoting themselves as a vegan-friendly company. For Dr. Bronner's to support an organization who is promoting the false idea of humane animal agriculture goes against everything they used to stand for. And it makes their new campaign to "End Factory Farming" completely hypocritical in my opinion. So you decide. If they are supporting an organization like Farm Forward, are they really an company you still want to support? Too bad really, I did like their products. What are you other options? I like Mrs. Meyers. Do you make your own with vinegar? That's a bad idea, but I'll tell you why in another post. Have a great holiday. All ideas in this post are my own opinions. I have presented publicly available information and test directly from the groups involved. I have a first amendment right to my opinions. Just thought i'd add this in case Dr. Bronner's is the type to sue bloggers for pointing out what is going on. I never thought about booze not being vegan. Apparently it is a thing. Check out Barnivore. It's a super helpful site that let's you know what's what. In the meantime, here's why you're here. I have recently fallen in love with Angry Orchard Hard Cider and thought, of course it's vegan! Nope. I was shocked when I saw on Barnivore that some of their ciders are not. So, of course, I emailed for confirmation. We hope you will get a chance to enjoy some of these vegan-friendly cider styles soon! Cheers to you for branching out and continuing to explore Angry Orchard! Argh, I just had the Crisp Apple and loved it. Oh well, thankfully, they have other options. Remember to drink responsibily this holiday season.